Louisville, Kentucky (March 22, 2019) – Together with presenting sponsor Chase, the Leadership Louisville Center and Today’s Woman magazine host 100 Wise Women to bring successful women leaders – Wise Women – together with emerging women leaders to share perspectives on themes presented by distinguished keynote speakers. The 2019 speaker line-up for 100 Wise Women will feature a series of women leaders as keynote speakers beginning with the first event on May 15 featuring Linda Cash, VP, Quality & New Model Launch, Ford Motor Company, who has been recognized by Automotive News as one of the 25 leading women in the European auto industry, was honored in Black Enterprise’s 2017 list of Most Powerful Executives in Corporate America and 2019 Most Powerful Women. Additional speakers for the series include one of the top leaders of Humana, a former Silicon Valley CEO now helping kick Louisville’s startup ecosystem into high gear, and a leader driving change as part of the Executive Leadership Team at Papa John’s International. • June 26 – Jody Bilney, Chief Consumer Officer, Humana Inc. Registration is now open for both the May 15 and June 26 events, both will be held from 8-10 a.m. at The Olmsted, 3701 Frankfort Ave.; the cost is $35. 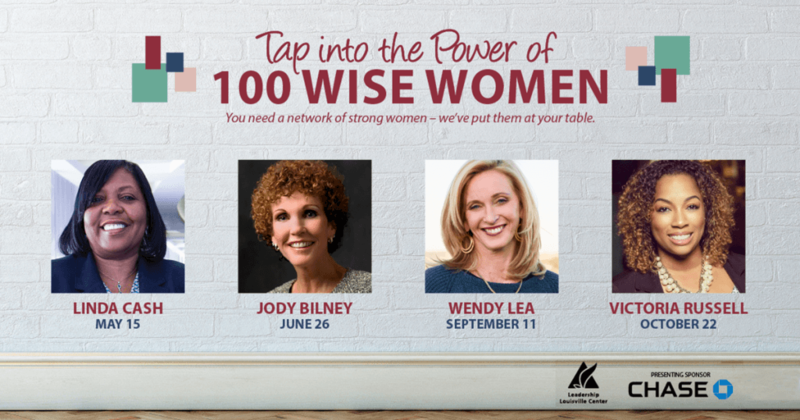 These events sell out quickly, so register soon at www.leadershiplouisville.org/our-events/100-wise-women/. For more information, contact the Leadership Louisville Center at (502) 561-0458 or email info@leadershiplouisville.org. Designed to increase the base of Louisville’s qualified, connected women leaders, over 1,200 women attended the events in 2018, representing over 400 companies from industries including major employers, small businesses, professional service firms, universities, government agencies, and nonprofit organizations of all kinds. Every event has sold to capacity since the series started in 2007. Proceeds from 100 Wise Women go to the Joan Riehm Women’s Leadership Fund, created to allow women to participate in Leadership Louisville Center programs. Since the scholarship fund was created in 2007, 150 women have received scholarships totaling more than $142,000. 100 Wise Women is held in partnership with the Leadership Louisville Center and Today’s Woman magazine. The Presenting sponsor is Chase.